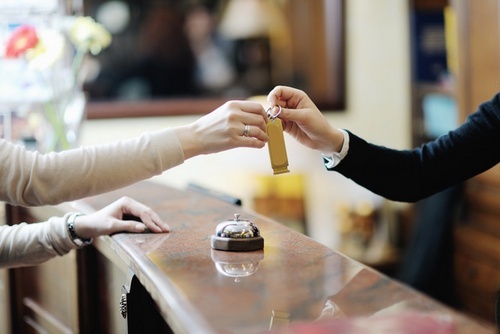 If you've traveled for business or pleasure, you've probably spent time in a hotel. If you're a fan of horror stories, you've seen plenty that involve hotels too. So which is it: home away from home or den of iniquity? According to these behind the scenes stories from hotel employees, maybe a little of both. Check the seals on the things in the minibar. I once had a guest who had drunk the whiskey and then peed in the bottle, closed it, and put it back. I stayed on the "club" level of the Ritz once and the butler guys in the club would say yes to just about anything I'd ask (it was all free in there). Can I have 2 redbull vodkas, a jack and coke and a warm chocolate chip cookie? I asked if they ever said no. His response was "We aren't allowed to perform sexual favors and we can't sell you drugs but what you do in your room is your business." What's a Coverlet and Why Can't I Touch It? ...Two things I just learned: 1. Don't touch the coverlet. 2. It's called a coverlet. Edit: thought it might be interesting to mention that I also worked in a youth hostel for a while; time limits were NEVER even brought up there and that was by far the cleanest place I've chambermaided in. A guest in a central hotel in Stockholm showed up in a suit and with a briefcase, very proper. Paid in cash up front. Said bye the next day when he checked out. When the cleaners later came into the room the walls where smeared with feces. Top to bottom. I worked at the MGM in Las Vegas for 7 or so years. There are A LOT of people who make Vegas their last wish. There are many, many deaths weekly throughout the 5000 room hotel. Use a towel or sheet on the chairs or sofa, a LOT of people sit on them naked. ...As an ex housekeeper we used to wash the glasses in the bathroom sink and dry them with a clean pillow case. If they looked unused they wouldn't get washed. Well my aunt used to be a maid and she said the grossest thing they would do that she was like WTF? Was:" Do you know the water glasses that are next to the ice chest? They never really take those back to a place to get washed. They just have a rag that they carry to wipe them out with". I worked at a 5 star hotel for a few years... I did get to meet a lot of really famous people (Sandra Bullock, Jesse James, Mariah Carey, George W. Bush, Jamie Fox, etc.). ...Always tip your housekeeper on multiple night stays, they will remember you and they will pay more attention to your room until you leave. ...But....they're always cleaned after? Right? Right!? Read the fine print when you book a room. 95% of the time, you are only guaranteed A ROOM and you may not end up getting the king or double you booked. Don't be the last of the scheduled arrivals and pissed off when your room isn't exactly what you booked. Show up early and you'll get the room you wanted though. Because of this, I've always made it a habit to show up before 6PM at any other hotel that I have booked. I work in a 5-star hotel located in central Hong Kong. Yes, we have to comply with any request if the guest is considered a VIP. Not sure if this is interesting to you guys but we do have contact with locals when prostitution is needed. We simply make a phone call and girls will be delivered faster than pizza. No, I ain't sh--ting you.